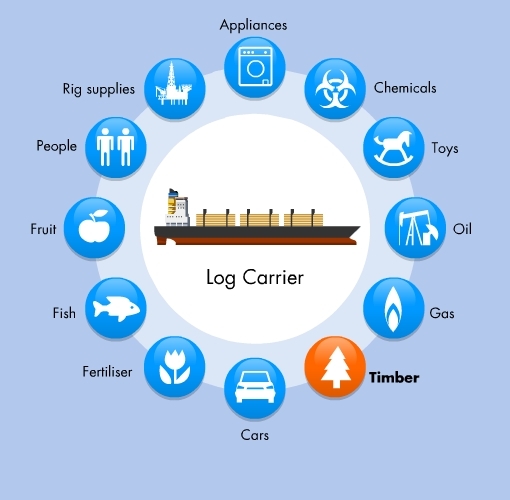 Not all cargoes can be as easily pigeon-holed as Containers, Crude Oil and Dry Bulk. Ever wondered just how over-sized, heavy or live cargoes get from A to B? These specialist cargoes have very different transportation requirements and the ships designed to transport more unusual loads fall into the broad Specialist ship type. A good example of a specialist ship is one that carries heavy and awkward loads. Known as Heavy Lift ships, these ships might be called on to transport products such as railway engines, giant container cranes for Ports and Terminals or wind turbines, as examples. These ships must be able to maintain stability while loading, moving and unloading these often extremely heavy cargoes. Some use Ballast to counterbalance the weight, while others use hydraulic feet to clamp on to steady themselves on the Quay. Ships designed to carry livestock also need a specialist design to ensure that live sheep and cattle reach their country of destination in the best possible condition. Climate control, feed dispensers, watering equipment and equipment for the removal of manure needs to be considered and large quantities of bedding and food have to be carried. Other specialised ships might include cement carriers, which carry no other type of cargo, and ice breakers, which keep the sea-lanes open throughout Winter, providing safe passage for ships through ice.